This girl was waiting for me when I got home–reminding me that it’s nice to go away but even nicer to come home. Betsy Maislen’s flowers were still beautiful. Betsy stayed with me between voyages on the J&E Riggin, a windjammer out of Rockland, Maine. Betsy volunteered for six weeks in September and October this fall. She LOVES to cook with Annie Mahle and to be on the Riggin. 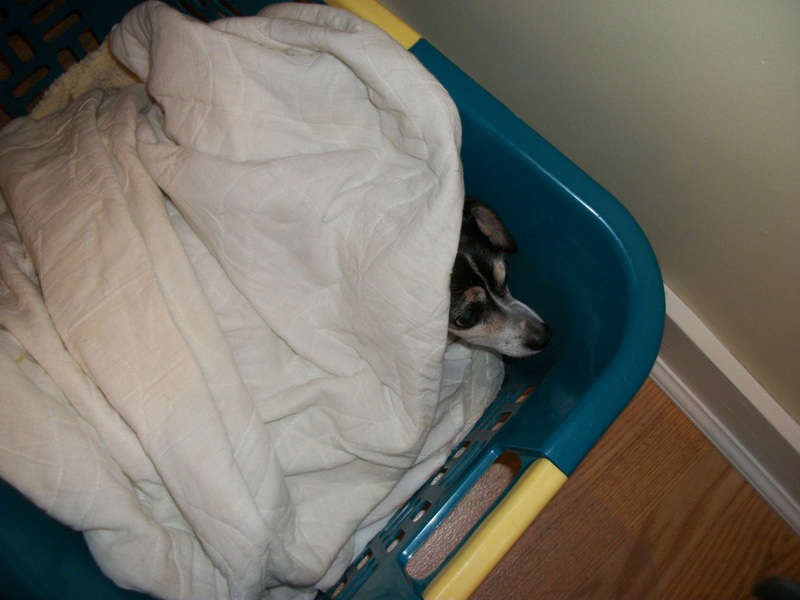 She also loves to get her clothes washed, to sleep in a real bed, and to be recharged and ready to go out again. And she made and sent me one of the cards I was kitting up for our retreat group to make–as a little gift for those who came. Amanda Jean Nyberg (Crazy Mom Quilts) designed this card project. You can find directions in her WONDERFUL book NO SCRAP LEFT BEHIND. I did a recent blog entry on these cards. Didn’t Betsy do a great job? Don’t miss the little owl on the right. I loved getting this card from Betsy. Betsy was at our May 2017 retreat and is planning to be at the May 2018 retreat. 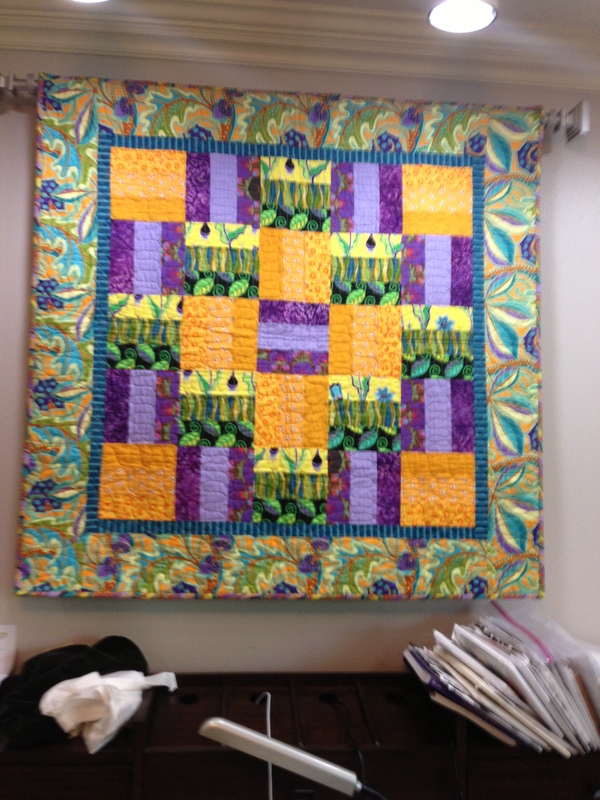 She retired this past June and is discovering that she loves to quilt. 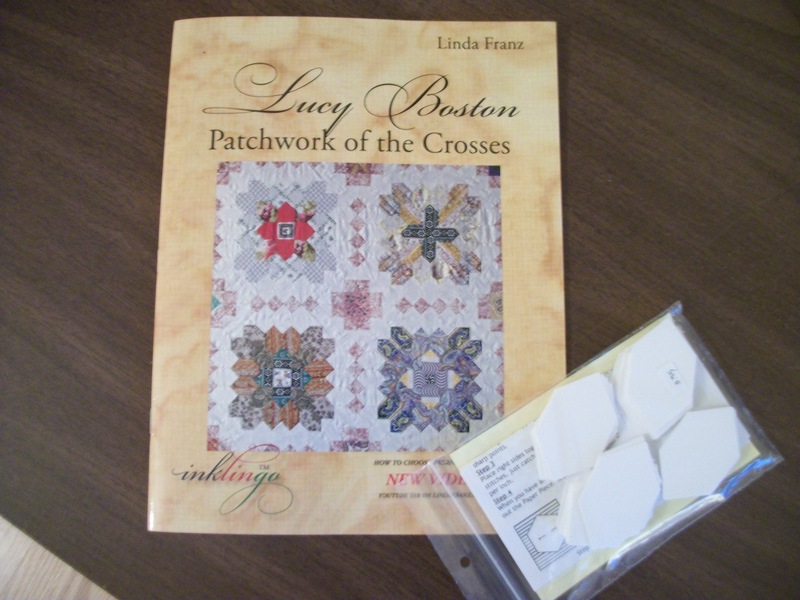 Rhea Butler introduced her to the Lucy Boston paper piecing blocks on the Riggin this summer–during the Slow Sewing cruise–and Betsy fell in love with them. She’s just finished her second one now. Pretty, huh? NOW, here’s a challenge for those of you who choose to accept it. 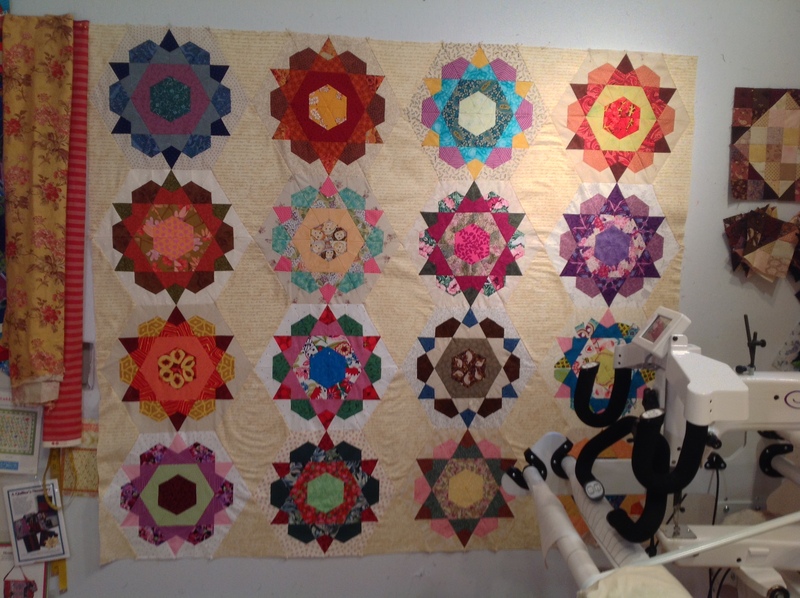 Some of us are challenging the Coastal Quilters to make Jen Kingwell’s pattern “Long Time Gone,” starting in January. 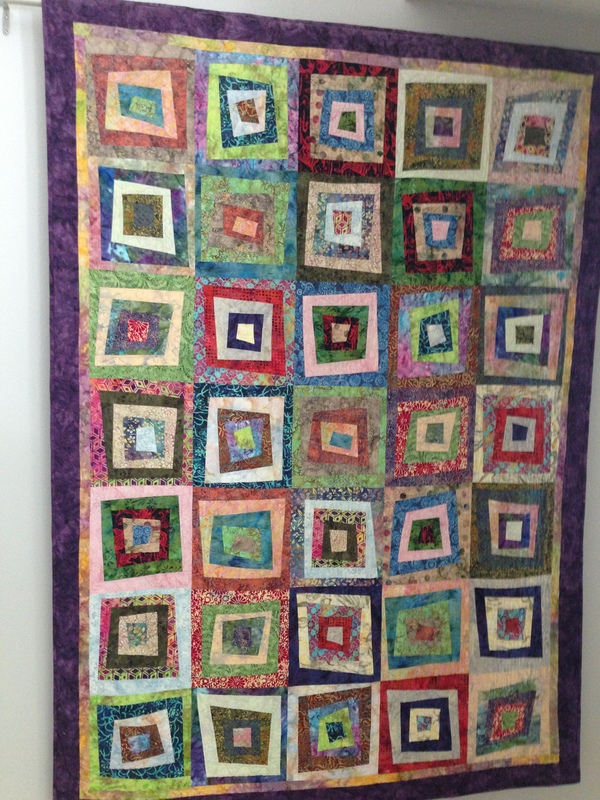 This quilt is an improv form and uses a lot of different blocks, so it is a terrific learning project. Besides it’s just fun. Betsy is going to do it with us from Vermont! 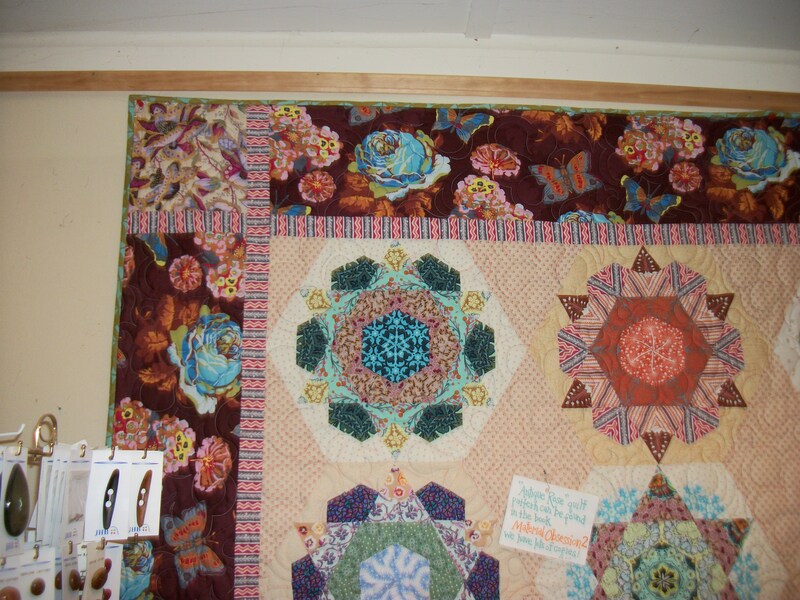 I’ll post pics of your finished quilts here on the blog. Here’s a version. To see others, google “images” for the pattern. Slow Sewing at Sea on the windjammer J&E Riggin, led by Rhea Butler of Alewives Quilting (Damariscotta Mills, Maine), courtesy of Co-Captains Jon Finger and Annie Mahle of Rockland, Maine. You can feel the peace and serenity on deck with this picture. It was heavenly to sew under the sun while we passed dropped dead gorgeous sights. We also did a LOT of laughing and sharing. For more pictures, go to Facebook/Instagram sites for Alewives Quilting and the J&E Riggin. I think we got the last two warm days of summer–hardy sailers swam TWICE! Here’s Mary B, wearing her signature pink hat–ringed with pins from her various trips/experiences. Here’s me with Captain and superb cook Annie Mahle. Boy did she spoil us with her outstanding culinary creations this trip–all local, clean, and glorious dishes. We boarded Tuesday night, sailed on Wednesday late morning, and fall came in with a bang on Thursday night. The cooler temps and some rain did not faze anyone. We went right on sewing and sewing down in the warm galley–those of us who did not stay up on deck in foul weather gear to enjoy the clean, crisp fall air. We returned to Rockland on Saturday morning. Rhea Butler worked with Lucy Boston English Paper Piecing (EPP) this trip, and I learned so much from her, including a new stitch that really works so that stitches are not seen on the front of your work. I also learned so much from my fellow passengers. I came home with a boatload of new friends, many of whom will come back next year, and some of whom I will see again over the winter as they live just south of Camden. I stopped by Fresh Off the Farm yesterday to get a few vegetables. I could not resist the organic Driscoll strawberries. They looked luscious, and I was hungry. I had some this morning, and I knew from the moment I touched them that I had made a “hungry” mistake: bright red, but sour as lemons. 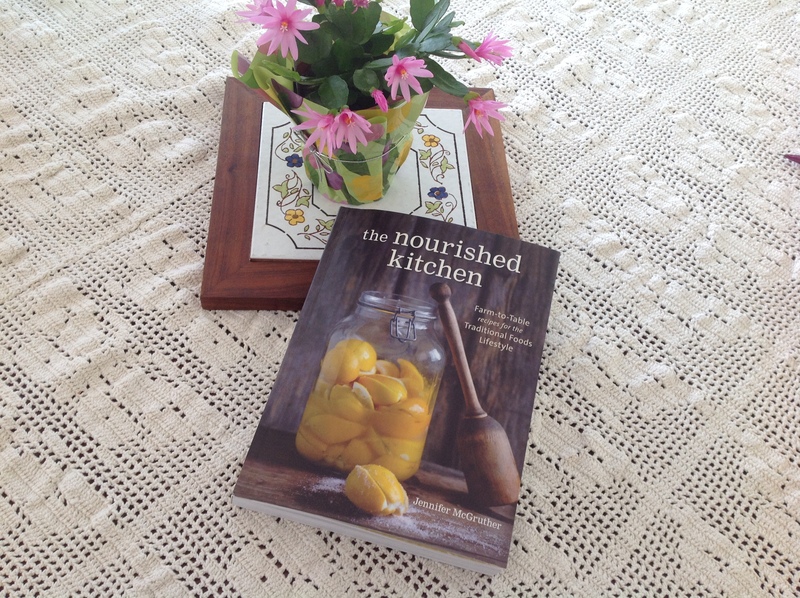 I am so enjoying reading, now, Jennifer McGruther’s The Nourished Kitchen. Fruits and vegetables prepared in their season bring joy to the table. As the days turn from dark to light as spring nears, and just when you’ve had enough of hearty stews and root vegetables, the brightest and lightest of vegetables appear–sprouts, herbs, tiny little strawberries, and crisp lettuces. These vegetables fade and bolt with the heat of summer that, in its turn, brings robust and juicy foods–watermelons, vivid red tomatoes, and plums that drip with juice at the first bite. The days grow dark and cold once more, and the apples, pumpkins, potatoes, and roots return. The changing seasons bring excitement and heady anticipation that cannot exist in the seasonless aisles of the supermarket. I have a feeling that the chickens will enjoy the strawberries. I’ll be waiting for my own to come into season, and believe me, they are worth the wait. I woke to rain this morning. And, then, magically the sun came out, and I changed clothes and went out. The project: replanting the climbing rose and clematis in front of the new fence panels that shield the propane tanks and the generator. AND, re-carving out the flower beds in front of those panels. As I worked, it was glorious to see the summer thunderstorm moving towards us. And to hear it! 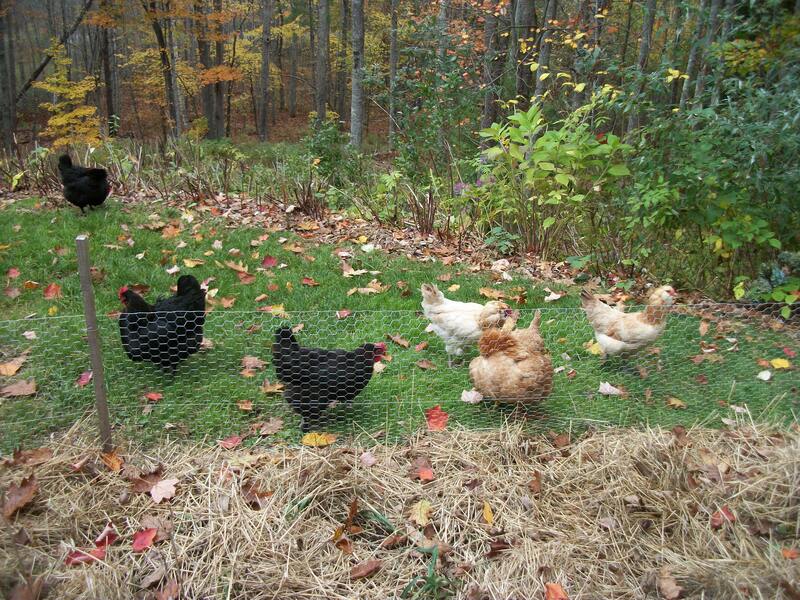 It was NOT glorious to see the chickens out of the fence that I installed yesterday. They are jumping over it from a large bush next to the fence. But they have to stay inside as fox ate one of the hens this week–one of the two hens that are actually laying. You will remember that the pattern last year was one missing hen one day, all chickens missing the next… So as the rain came in, I was shooing chickens back inside their enclosure. (I have an idea for how to block that jumping off bush.) And I’m hoping that one of the hens will go “broody” and raise a batch of eggs by my sweet rooster and the one hen that is laying. Anyway, when it stops raining, I’ll post some pictures of all the work that Stephen Pennoyer has made possible at this house. I have been blessed, blessed, blessed to meet him. He is so competent, skilled, cheerful, and an awesome worker. What a gift! 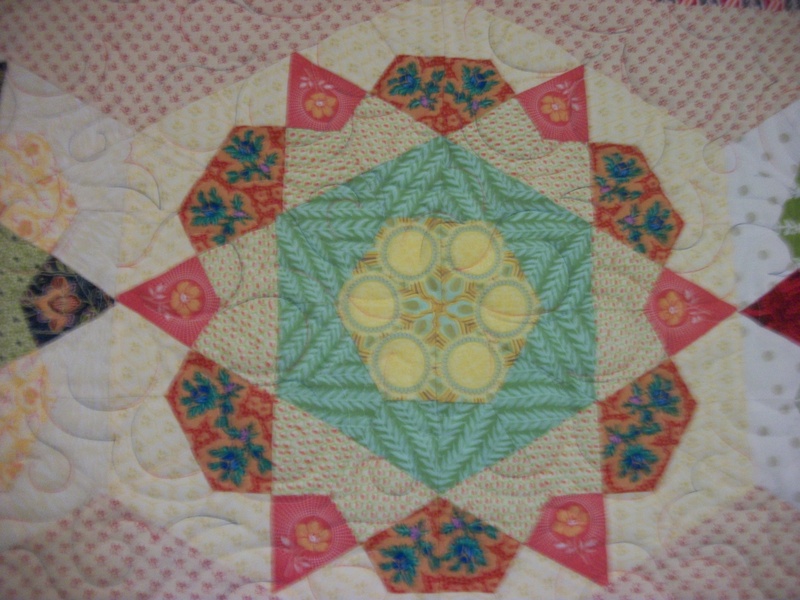 Don’t mind the wrinkles around the diamonds–it’s just how the quilt is sticking to the flannel–and I have not ironed much as there are so many biased edges. I won’t really iron it until I get the borders on it. BUT, BUT, I think it really needs one more row. It’s looking way too…SQUARE. So, I’m picking out fabrics for four more blocks and will “unsew” that bottom row so as to be able to insert the required diamonds. I think you can see the method of construction on the diagonal lines here. I could not find a big, bold border so am going with a quieter one that lets the medallions shine. We have our Coastal Quilters’ meeting this Saturday, and I want to “Show and Tell” the baby quilts before mailing them on Monday. Then it’s on to my niece’s baby daughter, also due in June. 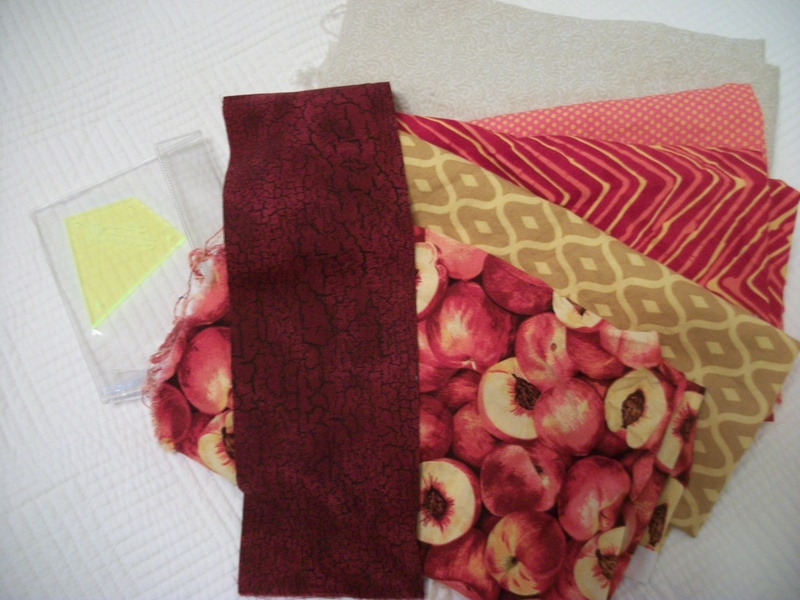 I am excited about the fabric that I’ve bought for baby Stevens’ quilt. I think my obsession all started with Bonnie Hunter’s numerous posts on her hexie projects. 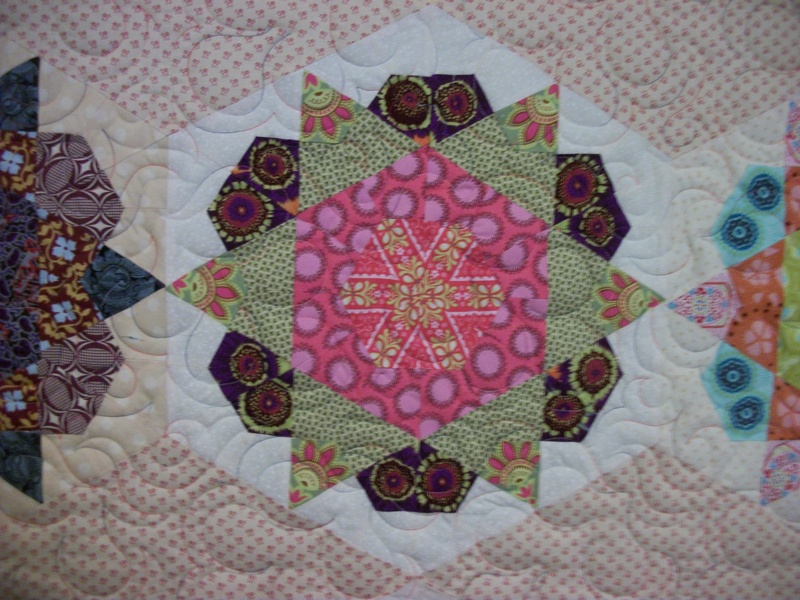 Hexies are all the rage in quilting these days, which I’m sure most quilters know. And these projects are NOT your grandmother’s flower garden variety. I did a hexie project a while back–a challenge to depict a grocery store product–I chose Green Hive Honey, a local raw, unheated honey. That quilt was called “A Thousand Flowers” since that’s what it takes to make a ridiculously small bit of raw honey. (You can search for it elsewhere on the blog.) I found sewing the hexies tedious–especially the whip stitching that joined them. And the stitches showed in a way I didn’t like. BUT, But, But! There is a better way to do this whole process. 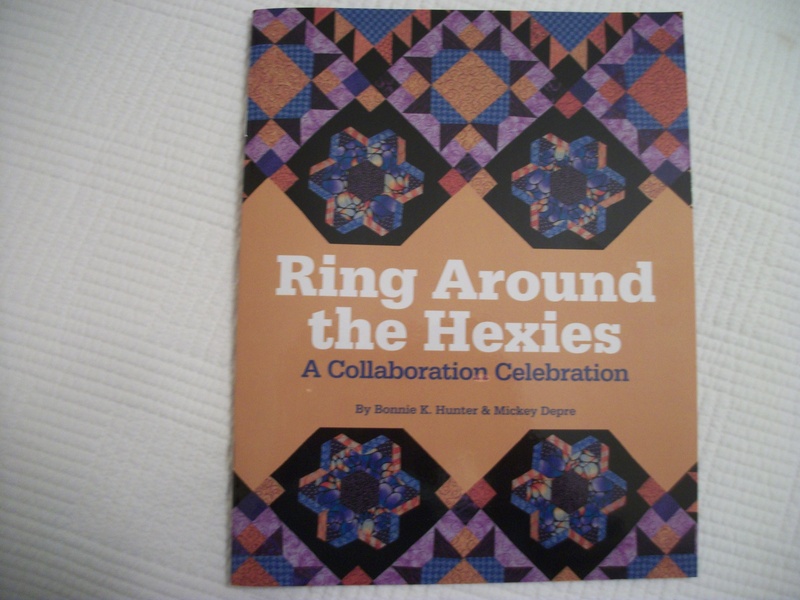 And I began to discover that only recently with Micky Dupre and Bonnie Hunter’s book, RING AROUND THE HEXIES: A Collaboration Celebration. So, Bonnie makes a pieced quilt, leaving, in the above case, blank black squares on-point. 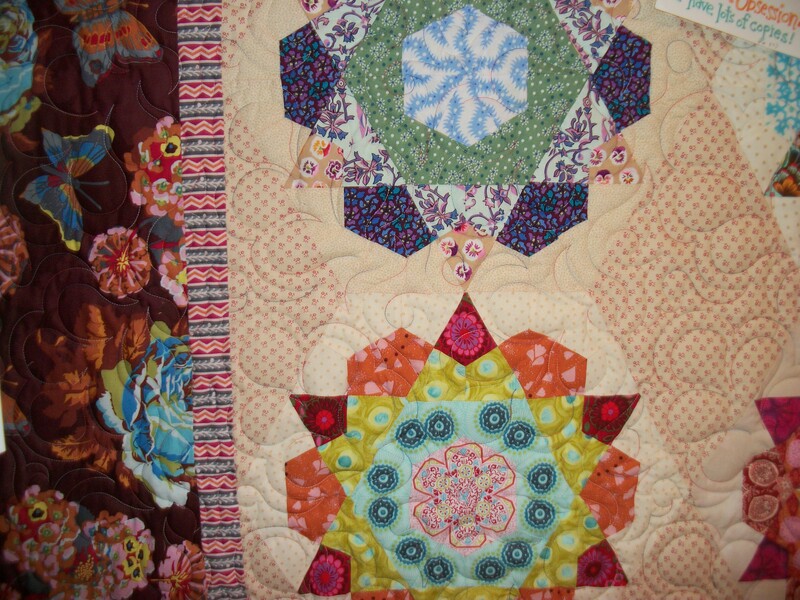 Micky pieces a hexie formation–and she manipulates the hexies to get interesting color changes–and appliques her arrangement onto the quilt. They are beautiful. The resulting quilt is beautiful. 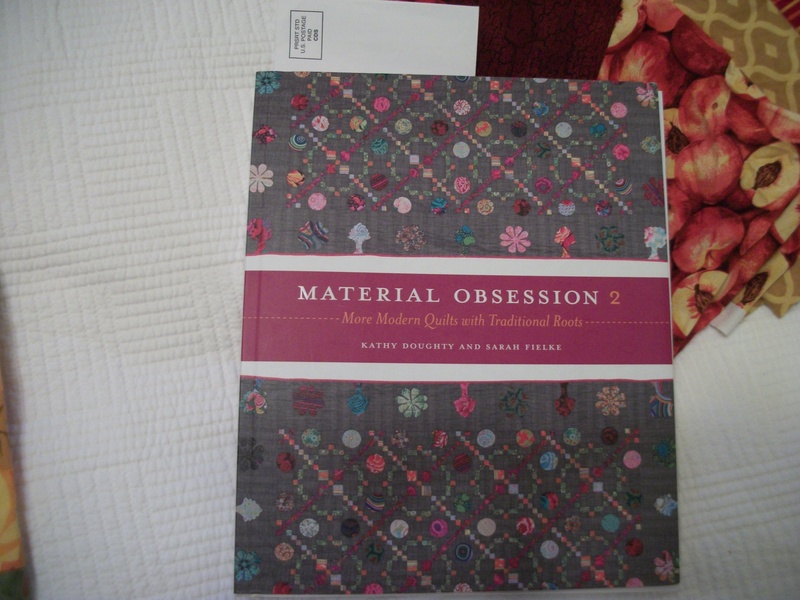 But, I think my own obsession stemmed from Rhea Butler’s quilt from MATERIAL OBSESSIONS–hanging in Alewives. And somehow I did not take a picture of the whole quilt. That quilt is made of large hexies–all constructed from a kite-shape (a quadrilateral) that when combined forms a hexie. Here are some examples of those bigger blocks. You can see the “kite” in the dark, outer prints with circles–it takes two “kites” to form that dark patch. The outer neutral fabric is also made of the “kite” shape. The red dotted fabric is used to link a line of blocks together–it’s a large diamond shape. These big hexies are joined with interesting geometric shapes and lavish, BIG borders from contemporary fabrics. Here’s fabric for my first try at these blocks–and you can see the kite template. The dark fabric will be used on the outer ring. I suspect the peach fabric will form the inner ring. I was going to do these by hand, but Rhea says they sew well on the machine, too. So, I’ll play around. BUT, if I’m not going to hand-sew these, what is going to occupy my fingers? Take a hexie and pull out the sides, and you get a “honeycomb” hexie. 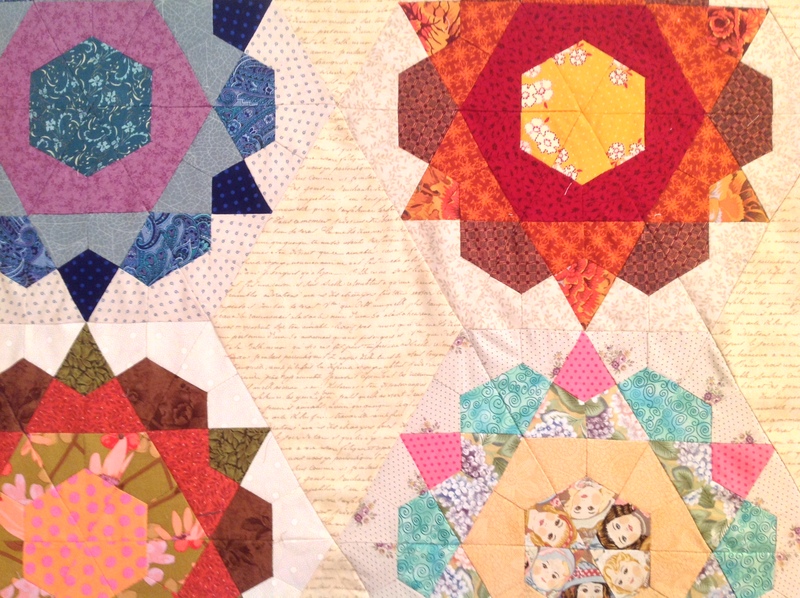 And back in the day in England, a woman named Lucy Boston used that shape to construct the most amazing quilts. Rhea Butler was already playing with this honeycomb hexie when I saw her last. Here’s the book, done by Linda Franz, and a packet of honeycomb papers. One varies the block by varying the fabric color within the block. Whatever I do I’ll pull from the stash. So, on to Leah Day’s excellent video. For an Air Force Brat whose family moved around a lot, old friendships go back to either my mother’s home town, Reynolds, Georgia, or to high school. I went to about 14 different schools over the course of my education. So I can’t remember who my teachers were or, in a lot of cases, who my friends were. Something about that kind of transient life just whisked away memories other people hold very dear. The closest I can come to these old memories is high school. We were stationed in Omaha, Nebraska, home of Strategic Air Command (SAC) headquarters. I think this posting was the longest we ever had–and I still went to three different schools. I arrived at Bellevue High School in Bellevue, Nebraska, which was adjacent to Offutt Air Force Base, in my sophomore year. (I went to Central HIgh School in Omaha my freshman year, and made a long bus ride to get there. I didn’t know a single soul and could not break into cliques of students who had known each other from pre-school. But a lot of Air Force Brats attended Bellevue High School–and I knew Becky Reavis (now Meyer) from Barksdale Air Force Base in Shreveport, Louisiana. After Barksdale, we went to Tampa, Florida. I don’t know where Becky went, if anywhere, before Bellevue. But she was there, and she took me under her wing immediately. She is a year older, class of 1962. I had many friends in the class of 1962. Among them is Carroll Risk Rhodes, who called me out of the blue the other day. And guess what? 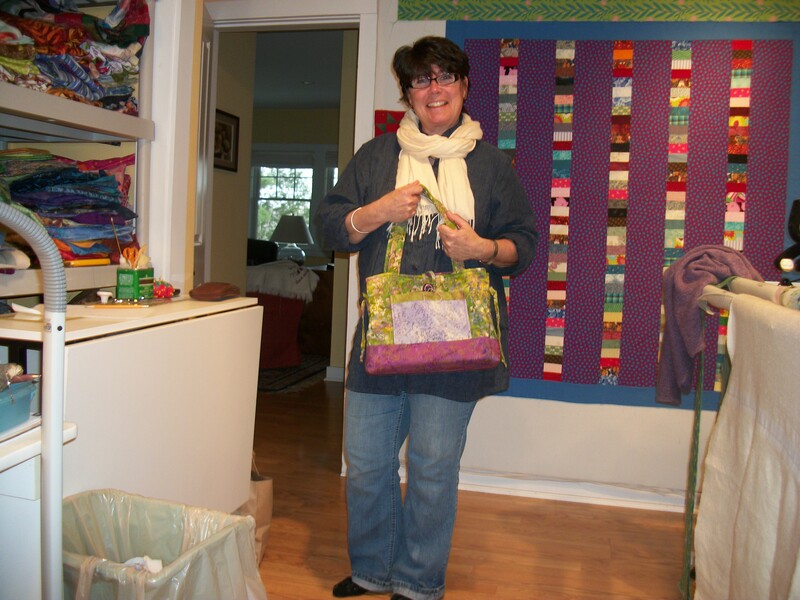 She’s a passionate quilter too and still makes a lot of her clothes. 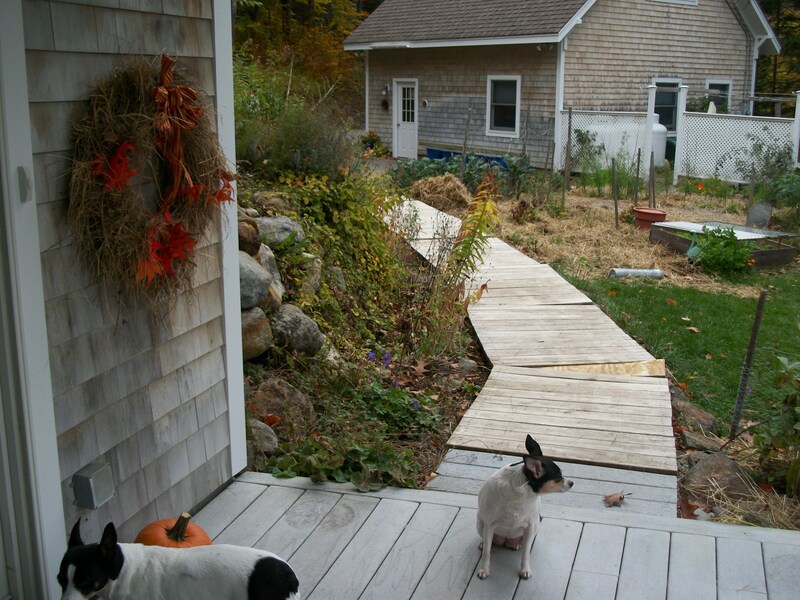 Here’s a stunning, contemporary “rail fence” idea. I love Carroll’s use of color here. Isn’t the border fabric wonderful? I wonder if she chose the block colors using the border fabric or chose the border using the block fabrics? This idea would be a fun way to use stash fabrics, too. Here’s another contemporary quilt, and again, I love the way Carroll uses color. 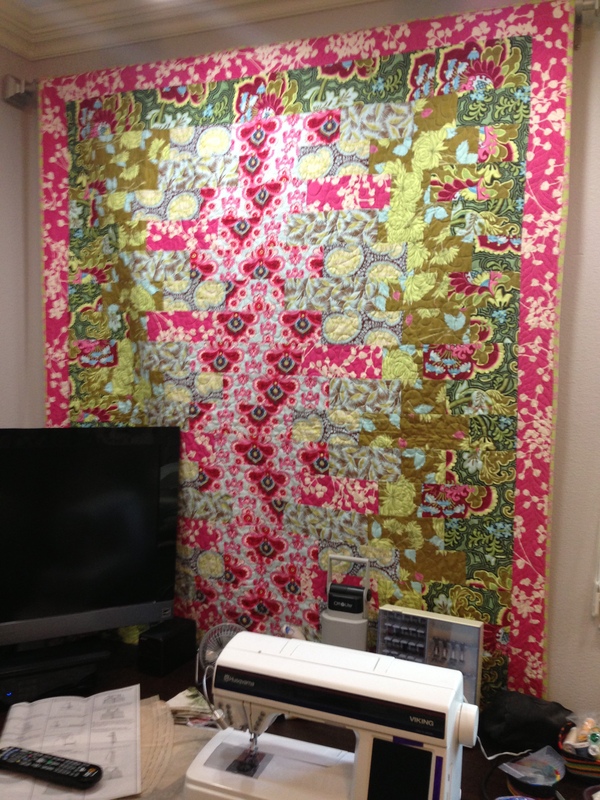 This one hangs in her sewing room. 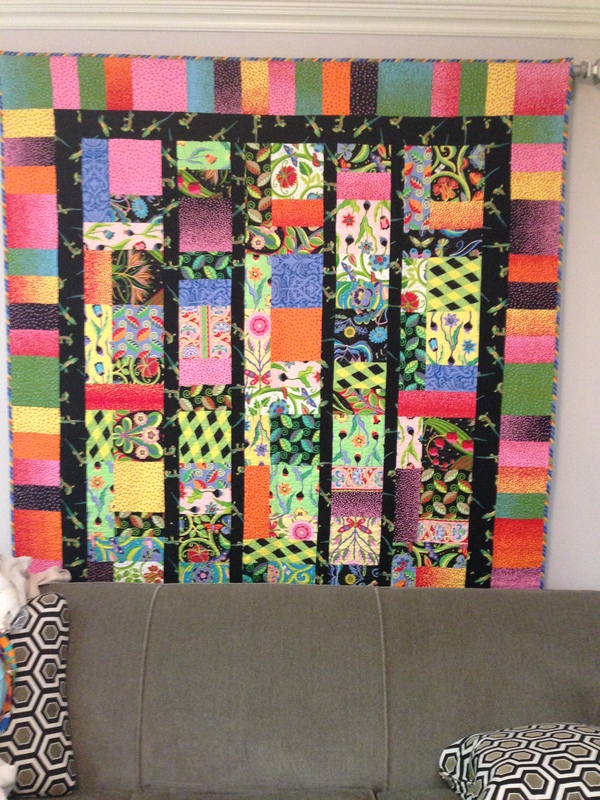 And, finally, how fun is this quilt which Carroll has back of a grey couch. Love the contemporary way she has used the bar form, and the piano key border with random widths is terrific. I’m trying to talk Carroll into coming to Maine to visit and quilt with me. But she lives in Florida with a water view, so I know it’s going to be tough! 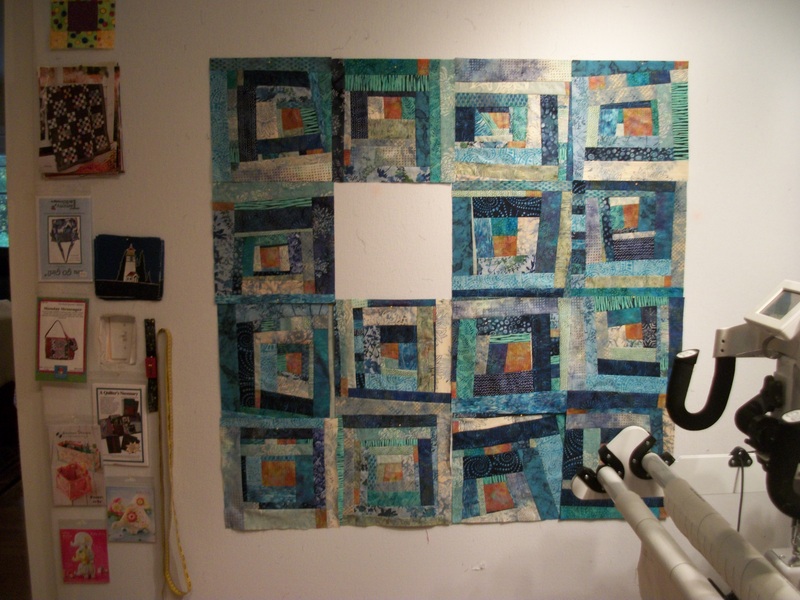 It would be so fun for our Coastal Quilters group to meet her and see her quilts. Thanks for calling me, Carroll! And, my own 1963 Bellevue High School class is having its 50th reunion this September in Omaha. I have reconnected with so many of my classmates recently, and that has been wonderful, too. Rose told me months ago that she’d love to make a purse like mine. 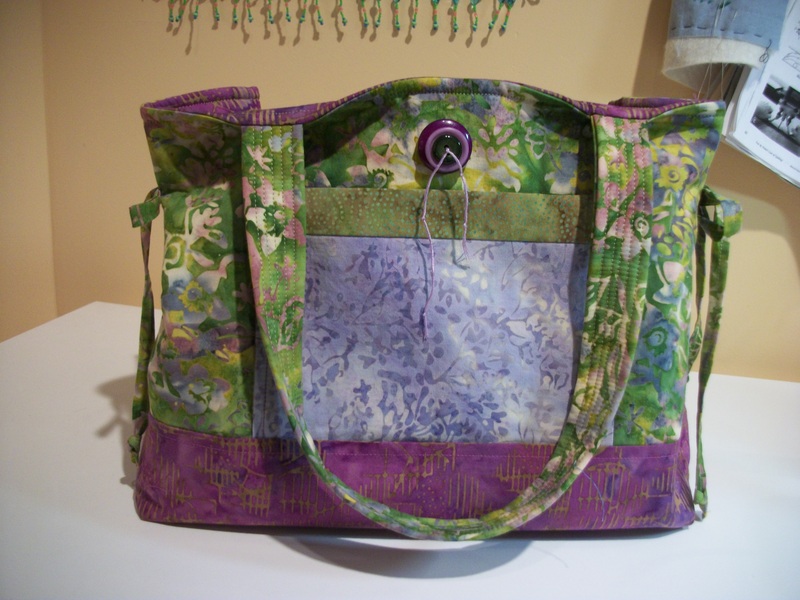 My purse is made from the Bow Tucks pattern that is so popular with quilters. I love it, and when I wear one out; I make a new one immediately. Rose is a VERY busy woman. She bakes bread and pizzas for TWO farmers’ markets–in her wood-fired oven. She bakes pizzas to order for pick-up on Tuesday and Friday nights–and boy are they delicious! She also bakes cakes to order and cakes and cookies for the farmers’ markets. She has a big flock of chickens who give her eggs to sell. 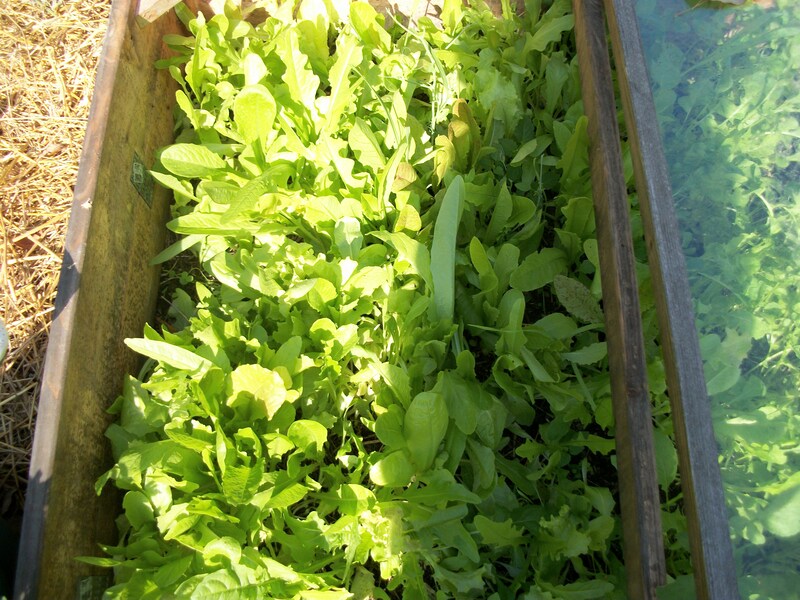 She raises all kinds of greens and veggies to sell at the markets and in her seasonal farm shop, The Vegetable Shed. She also makes and sells all kinds of yummy things–like the wood-fired roasted plum tomatoes she gave me last summer. Or, pickles. Rose is always already inventive with preserving food. Rose really only has Monday free. So, one Monday recently we went down to Alewives Quilt Shop in Damariscotta Mills, because Rose had never been to see the Alewives fish ladders or that lovely little settlement. Alewives Quilt Shop is also lovely and one of my favorite places to shop for quilting supplies. And, on the next Monday, we made her purse together. I cut and ironed, and soon it was done! Here it is. These magentas, purples, and spring greens are favorites of Rose’s. She uses them on her business card as well. Here’s a web site for this purse pattern. There are, also now, web sites that claim they have the pattern for free. My own feeling is that whoever designed this wonderful purse needs to get full value for that work. NOTE: The pattern we got for Rose had been updated. In the new pattern, the front pocket is sewn on independently of the seams in the purse’s body. 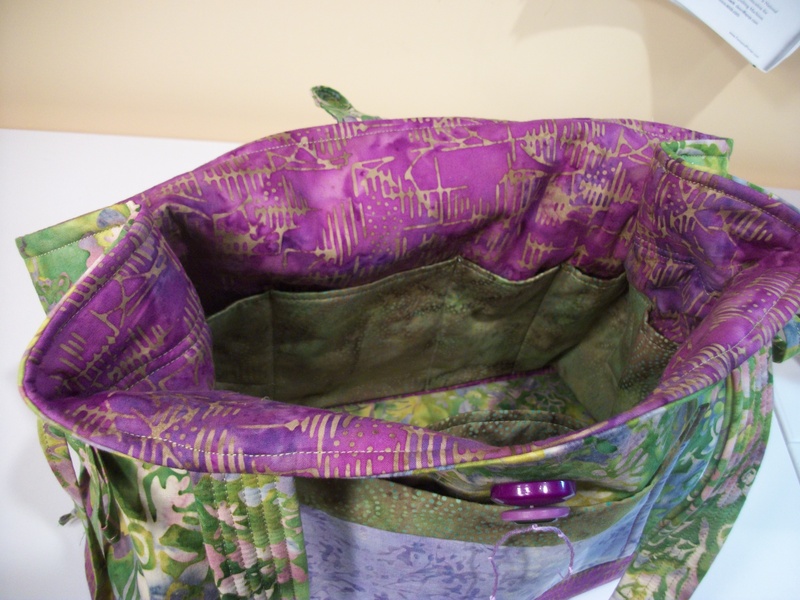 I far prefer to anchor the bottom of the front pocket in the seam of the front’s upper and lower purse bodies–which is what my, older, pattern did. You just center the pocket and insert its bottom into that seam and sew them together. Then, you sew down the purse’s sides, anchoring the top of each side with some extra stitches. We’ve had the loveliest Indian Summer here on Mid-Coast Maine. But, as we move into November, the weather is suddenly colder and our thoughts are turning toward getting out warmer clothes. 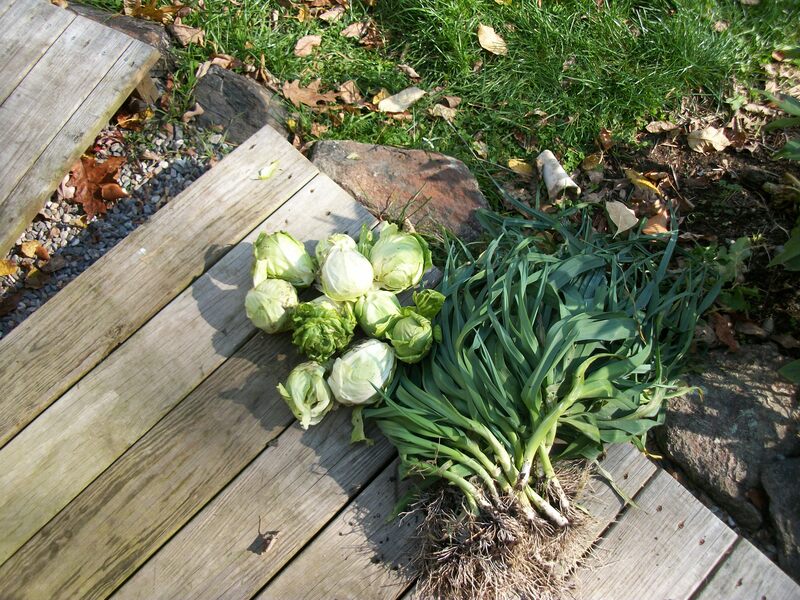 We’ve nearly finished winterizing and final harvesting. It’s actually a lot to do. But all the pots, except one by the garage door that John can’t part with yet, have been emptied, cleaned, and stored. And, all the porch furniture has been stored in the garage. The hot tub has been emptied, cleaned, and been filled with fresh water. The chicken coop has been moved and all the bedding cleaned. I’ve put straw around it for the winter. I’ve planted next year’s garlic and mulched the strawberries. We’ve put up the boardwalk, and John has cleaned it. The wood grows mold over the summer, as it’s in the shade on the north side of the garage. That mold is incredibly slippery and dangerous. You can see, too, that the garden has been bedded down with straw. THat’s a roll of 2-foot chicken wire we’ll put around the low side to keep the chickens from scratching the straw out into the grass. I like them to scratch in the garden; it breaks up the straw and blends it into the topsoil. The leeks I planted did very well this year. I left some of the smaller ones in the garden and covered them with straw to overwinter. The cabbages were small. We had a really rainy, cool August, so I think they didn’t get enough sunshine. They’re tasty though! And we’ve been enjoying leek and potato soup infused with carrots and cabbage, cooked until veggies are tender, and made smooth with a hand-held blender. Often I throw in some of the last of the parsley chopped fine. Serve with a big chunk of butter or a swirl of heavy cream. It’s the classic French recipe, actually. We’ve strawed the front bed, fenced it, and trimmed back all the raspberries, bayberry bushes, and rugosa roses. So, the chicken briar patch is gone. The chickens miss it, too, especially as our driveway hawk has been stalking them lately. 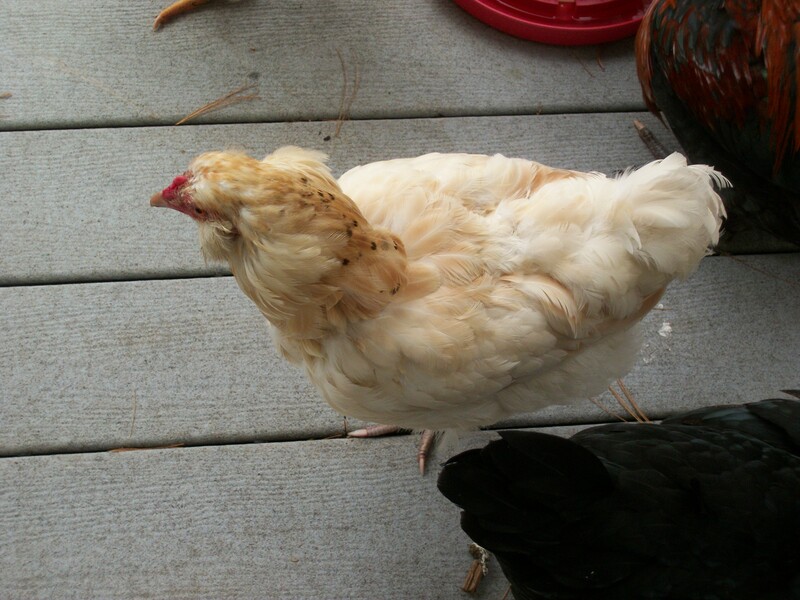 Nancy and Sally are molting big time, and they are sad to behold. Nancy is the most extreme at the moment. She has big feather quills coming in all around her neck though. 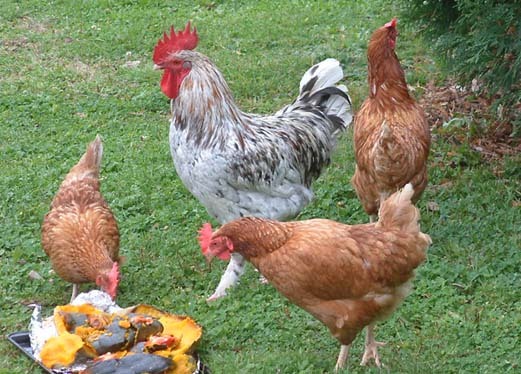 Chicken feathers are almost all protein, so it takes a lot of energy for a chicken to molt. They don’t lay while molting, and since Pearl has not started laying (??? ), we have no blue eggs. Nancy misses her tail feathers I think. My Roo, aka as Pretty Pierre, is really coming into his own. Not a leaf drops in the yard that he isn’t right there to see what it is. 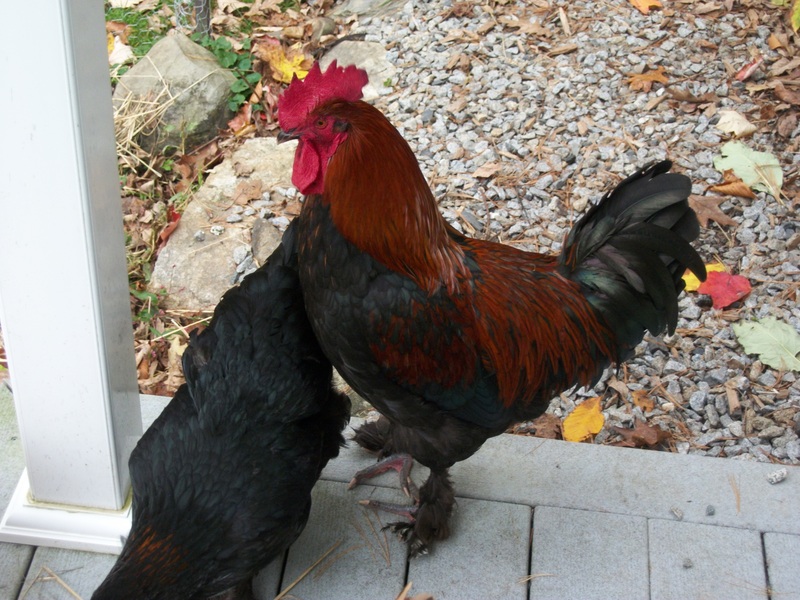 My friend Carole Whelan of Birds and Bees Farm sent me a picture of her new rooster, a Splash Maran. Isn’t he a pretty fellow? 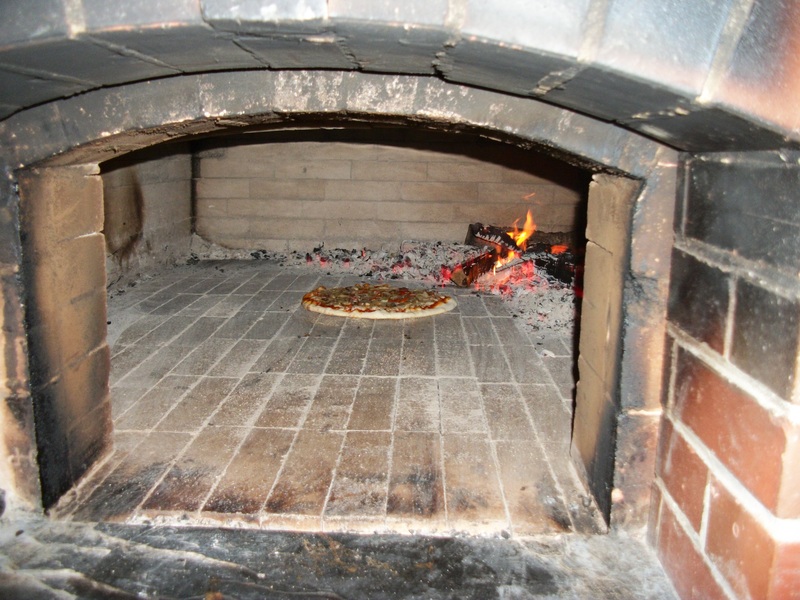 Friday nights bring the added joy of picking up a pizza made in Rose’s wood-burning oven. (Rose and Peter Thomas, The Vegetable Shed, Lincolnville, Maine.) Rich smoky flavors play over the vegetables from her farm–over meat and cheese and sauce she’d added or made. What a treat! This picture is overexposed with the camera’s flash, but you get the point. Are we spoiled or what?